Sat. Nov. 3, 8pm, Original. Online tickets now on sale! “That’s always been my mission,” says Les Stroud, environmentalist, musician, filmmaker, and creator and star of the groundbreaking TV series Survivorman. “To reconnect people to nature. 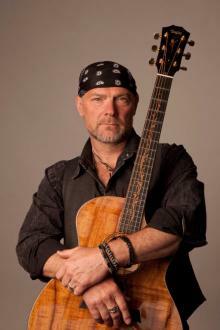 To get them to celebrate and protect nature.” As the host of the Discovery Channel’s Survivorman, Les Stroud entertained viewers with his immersive approach to the wilderness, but the Canadian-born Stroud also spreads his nature-first message via music, releasing his own albums of guitar and harmonica-based blues, folk and rock songs. "Stroud's stage show is a combination of acoustic singer-songwriter, rock 'n' roll in a band setting and intimate question-and-answer period that pays homage to his claim to fame as the TV pioneer who created the survival genre. He happily conducts a meet-and-greet after the show. "As one might anticipate from his experience as a wilderness adventurer and trained survival instructor, Stroud's music is inspired by nature.